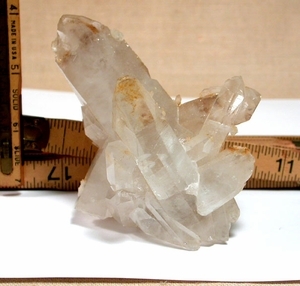 White [rarest] and chlorite phantom quartz floater cluster, cabinet sized at 2-1/2x 4-1/4x 3-1/2" sports blazingly clear crystals, tabular and uncommon 7h faced crystals, rare stepped faced points, classic penetrators, rice shaped crystals, three fleabites, intense parallel growth, doubly-terminated barnacle points, natural etching and great luster. Largest point is 3/4x 1-1/4x 4-3/4". Record keepers.